The North West of England has the highest number of septic tanks in the UK, in addition to this the North West is home to environmentally significant and sensitive water habitats, beautiful rivers and lakes and a relatively undiscovered coastline which should sport numerous blue flag beaches! Cumbria also supplies drinking water to households throughout the North West and our economy is heavily dependent tourism. Septic tanks are miniature sewage treatment works which store and treat the waste from homes that are not connected to the public sewer network. They return partly treated water to local water courses or into the ground. A properly maintained, fully functioning sewage treatment system is crucial for a safe and healthy environment. If it fails, it’ll start to smell, spread disease to humans and animals and pollute rivers, lakes, coastal waters and groundwater. A failing system could also resort in enforcement action being taken by the Environment Agency if nothing is done by the homeowner or business to address the issue.cant and sensitive water habitats, beautiful rivers and lakes and a relatively undiscovered coastline which should sport numerous blue flag beaches! Cumbria also supplies drinking water to households throughout the North West and our economy is heavily dependent tourism. Many people are not aware of how to look after their septic tank or sewage treatment system, nor do they realise the impact that a failing system can have on the environment. The “Call of Nature” campaign has been set up to engage with the public on a more targeted regional scale, to try and help people avoid an unpleasant and potentially costly mess from a failing system. If you need advice and information on how to manage your septic tank visit the Call of Nature website to find out more and download the septic tank toolkit. This project is funded by United Utilities and lead by LoveMyBeach. In addition to ourselves, there are many organisations working to deliver the project on the ground, including: British Water, Eden Rivers Trust, Healthy Waterways, Lune Rivers Trust, Morecambe Bay Partnership, Ribble Rivers Trust, South Cumbria Rivers Trust and Wyre Rivers Trust. 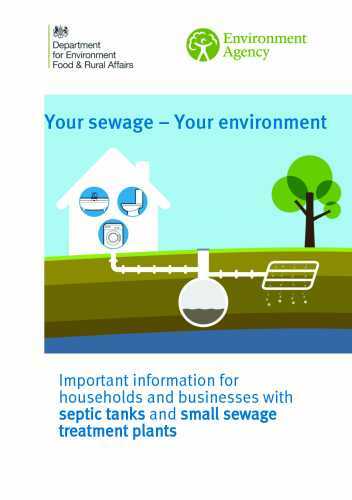 The Environment Agency publication ‘Your sewage - Your environment’ click the image below to download the full document.